Humanity has long had an interesting relationship with the night sky. Some cultures believed the stars were the souls of the dead gone to rest, others believed they were slits in the heavens that the gods used to watch down on us mere mortals. Now, we know more about the stars than ever before, and we know our ancestors were wrong. For example, while we see pictures in the stars, in cohesive other than how the stars appear close together from Earth - while actually, they're many light-years apart. 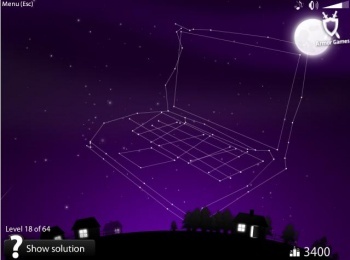 Starlight is built around that concept, asking you the player to drag a selection of stars around in the sky to turn a set of unrelated stars into a picture. While there's a harder mode involving timed puzzles, it's honestly not that hard once you get the hang of it - and it's incredibly relaxing to just sit down with the soothing piano music in your ears, watching this virtual night sky and trying to find the (surprisingly detailed) pictures in it. It's not the most intense Alt+Escape offering we've ever had - far, far from it - but it's very well pieced-together, and a great tool to help you relax for a Friday afternoon as you ease into the weekend.